For 2015, Hisense will be powering 3RC’s RockingFuture Career Expos. Aimed at matriculants in upper LSM schools across South Africa, RockingFuture is a high energy, educational, inspirational and motivating platform that encourages matric learners to make informed decisions about their careers and life after school. 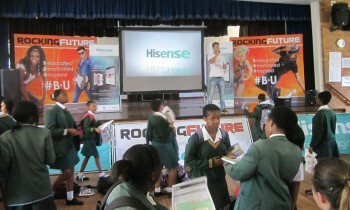 Hisense believes in constant innovation and improvement and this fits seamlessly with the ethos of RockingFuture as the platform provides the opportunity for learners to constantly improve themselves through education and being informed about the vast array of exciting prospects for them once they’ve finished school. The way children are learning is evolving with more schools introducing tablets in the classroom. Part of Hisense’s range of technology products is the Hisense Sero 8 Pro Tablet with Android 4.4 KitKat, an ideal companion to school learning. “The 2015 RockingFuture kicks off on Monday 19th January and features career guidance, preparation for a learner’s future and the biggest competitions we’ve ever run! The competition will see numerous learners walk away with Hisense products. Furthermore there is an overarching competition where 2 learners can win a R15 000 Hisense hamper from the MyPad Competition – all they have to do is follow Hisense on WeChat… it’s that easy,” explains Cheytanov. RockingFuture – powered by Hisense will be implemented in over 290 schools, reaching 35 000 matric learners in Gauteng, KwaZulu-Natal and Western Cape.